Malta men's basketball team won the gold medal in Serravalle. 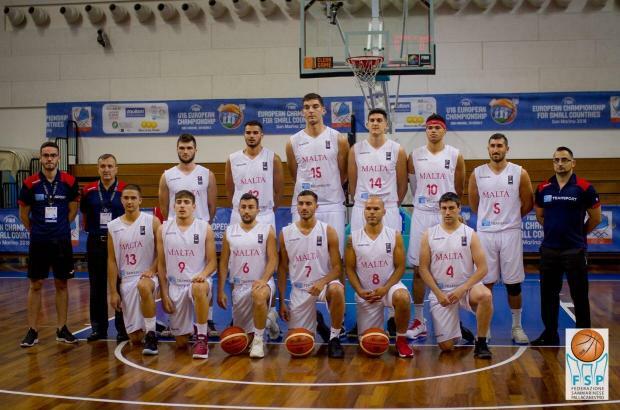 The Malta men’s basketball national team struck gold at the FIBA European Championship for Small States when they brushed aside Norway 75-59 in the final in Serravalle on Sunday. It was a commanding performance from Andrea Paccarie’s boys who completed a perfect week in San Marino in some style as they were crowned champions of the competition with a very impressive display. The Maltese made their intentions clear right from the outset as they managed to open a commanding 14-point lead by the end of the opening set, 22-8. Norway, somewhat, managed to keep abreast with Malta’s pace in the second quarter as both teams scored 13 points apiece to leave the Maltese leading at the interval 35-21 ahead. In the third quarter, Malta continued to hold the upperhand and inspired by the dominant Samuel Deguara underneath the boards they headed into the last session 56-37 ahead. Enjoying such a comfortable buffer, the Maltese managed to administer their advantage in the last quarter to run out as comfortable winners. Deguara was Malta’s leading scorer with 33 points.